Dear guests & partners let us introduce ourselves. We are a family run Hotel and Tourism company based here in Parga. Our ancestors started the very 1st hotel in Parga in 1884, ( the hotel Acropol ). Always being in the capable family hands, our parents expanded their operation by building another two hotels the Bella Vista Hotel Apartments, the Tourist hotel apartments. Our parents by seeing the changes in Tourism managed to send 3 of the 6 brothers to Switzerland in order to aquire higher education in Hotel and Tourism industry. We would like to offer our services with honesty and caring to all our clients (friends). We hope to be of service to all your needs and rest assure as travel industry professionals we will provide you with an excellent service. 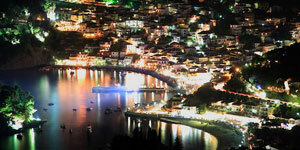 Parga village is an unspoiled paradise, steeped in history and the hottest holiday destination. Sandy beaches and crystal clear blue Ionian coastline will impress even the most discerning of clients. Parga, an ideal base to explore. Contact ITS Travel Services Office in Parga for great car hire rates or book an organised trip and hear information and history about Necromantion & Acheron River, Nicopolis ancient Roman archeological site, Meteora monasteries, Zagoria stone villages amd Vikos Gorge, Dodoni amphitheatre to sea excursions to the the islands of Paxos and Anti-Paxos. Also don't miss booking a day trip to Albania, a real interesting experience, contact us on email for more information, excursion prices and to arrange in advance, Email; info@parga.net or Tel + 30 26840 31833, we look forward to hearing from you. There's so much more to tell you...our goal is always '110% guest satisfaction'. We would like to introduce you to Parga's many historical attractions. For all your requirements when visiting Parga we look forward to being of service to you. With our warmest regards Antonis Zygouris & team.